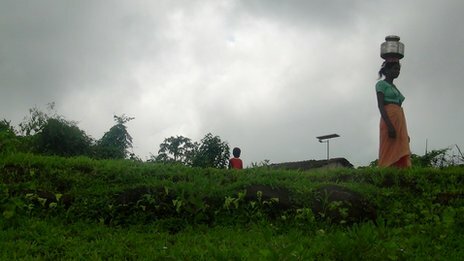 On the plateau of a verdant hill range, near India‘s commercial capital, Mumbai, rests a settlement of a small tribal community which has been waiting for five years for a permanent home. But, its members feel they have been forgotten by the authorities. At 21, Hemant Dhangar has a big responsibility of explaining the plight of his people to the wider world, because not only is he the only college-going youth in the community, he is also the most articulate. He believes they have been long forgotten by the outside world. This indeed seems to be true for the place has no water supply or electricity, it has no village council and there are no latrines, no schools and no post-offices. It is just a cluster of random huts on top of a hill. The tribespeople once had homes and engaged in farming. But five years ago the administration uprooted them from their village in Thane, 30km (18 miles) away from their present settlement, to construct a dam. The 200-odd families were offered a monetary compensation of 13,000 rupees ($234.84; £146.83) per acre of land and allowed to resettle on top of a plateau in the surrounding hills. But Asra Nagar, as the inhabitants call their settlement, was to be a temporary abode. “We were told our stay here will be temporary. We were promised electricity, water supply, school and other amenities. 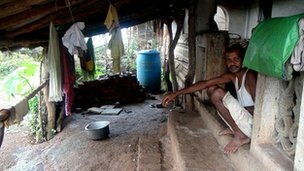 But five years on, things have not moved,” says Shantaram, one of those who lost his home. A woman, balancing a large pot on her head, is making a long trip to fetch water. Most of the men and women here work in quarries nearby, provided there is work. For days though, there is none, which means many of the villagers are forced to sit around idly. Children here look under-nourished as food, specially healthy food, is in short supply. No help ever reaches here so the villagers have decided to take matters in their own hands. “We have set up our own little food co-operative for the children. We collect money every week from all the families in the settlement, the collection varies between 200 rupees ($3.61; £2.25) and 400 rupees. This is spent on buying milk and medicine for the children,” says Shantaram, a father of three. The settlement is barely 150km (93 miles) from Mumbai and yet none of its residents have ever been to the big city. “Is it true that Mumbai never sleeps? Do you meet film stars?” asks Mr Dhangar. Mumbai and the region’s rapid economic development have passed this community by and actually, if anything, they are the victims of progress. A recent visit by authorities to the area raised hopes among the residents that they might after all be able to secure permanent homes. The tribal welfare ministry did not respond to our queries about the visit and what plans they may have for the community.